I have no memory of ever attending church with my grandparents. Growing up I never lived in the same town as they did – we always lived at least several states away. They were Lutheran (of course – my name is Walter Bitner, after all, and it was my grandfather’s name too) and I was raised Presbyterian. So although I had no shared church experiences with them, the two denominations share a lot of hymns between their hymnbooks: I knew the hymn well (which is as Lutheran a hymn as it gets – Martin Luther wrote it) – not only from my upbringing singing hymns in church, but from BWV 80 as well by the time I attended grandpa’s memorial service. I had no shared experience of that hymn with my grandfather, and no knowledge of his affection for it until that day. Yet ever since that day, I can never hear A Mighty Fortress is Our God or Ein Feste Burg (or think of it) without being reminded of him, and of my memory of standing there in the pew with my family, thinking about him – the man I am named after – and also about the fact that he was dead now. Death is always with us, throughout our lives. Sometimes it touches us more closely: when someone close to us or a famous figure we admire dies, when we have a personal brush that brings us close to death, through accident or illness. Death is always here, waiting for each of us at the end of life. Coming to grips with personal mortality is a vital part of each person’s journey through life. Whether you regard death as an ending or a beginning, as a sentence or a promise, with faith or as a mystery, I believe it is important to contemplate it throughout our lives so that when we finally confront our own ending, it is with some preparation. Music has a unique power to reach deep into our memories, to build associations, to console, express, and heal – the story above about my personal association of Luther’s hymn with my grandfather and his death is an illustration of this. As an elementary school music teacher and as a choir director for all age groups from elementary through high school, I made a conscious effort to include songs or choral works that acknowledge death in the curriculum I brought to my students. 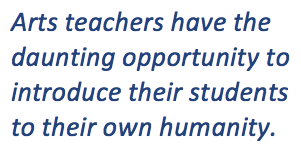 Contrary to current trends in education that seek to confine the teacher’s role to that of content presenter and assessment facilitator, I believe a teacher’s potential influence and responsibility for the kind of people their students become reaches beyond skills acquisition or content mastery. Arts teachers in particular, have the daunting opportunity to introduce their students to nothing less than their own humanity. The elementary school music curriculum should be built around a singing curriculum that includes hundreds of songs introduced over the course of the child’s elementary school career: songs that honor, celebrate, and describe many facets of the human experience. I began to write about this approach to teaching elementary school music here in my article about the ancient canon Sumer Is Icumen In. Death is not an infrequent visitor to songs traditionally taught to and sung by children, in fact – even if unbeknownst to the children themselves. For instance, the singing game Ring-a-round the rosie has long been thought to have originated with the bubonic plague – and the words can be attributed as alluding to it neatly – although this explanation is not agreed upon by scholars. Numerous nursery rhymes and songs end in the death in fact. A common example is A Frog He Would A-Wooing Go and it’s variants Froggy Went A-Courtin’, and the delightful Here’s to Cheshire, all three of which I taught to my students. Froggy dates back to the 16th century, like many of these old ballads, and ends in disaster when the unlikely couple (mouse and frog) are eaten by a cat passing through. I taught many kinds of songs to elementary school students, including quite a few ballads. Ballads provide the opportunity to engage the child’s imagination through storytelling, teach children about customs and the past, and memorizing ballads gives children a means to develop formidable powers of memory in a kind of work that is natural to them. One of the most popular ballads I taught to many students over the years is The Golden Vanity, an English ballad that exists in many versions; the oldest known surviving version The Sweet Trinity dates from the early 17th century, and Aaron Copland included a version The Golden Willow Tree as part of his Old American Songs (Set 2). A discussion of the history of this ballad can be found here on the Sing Out! website. 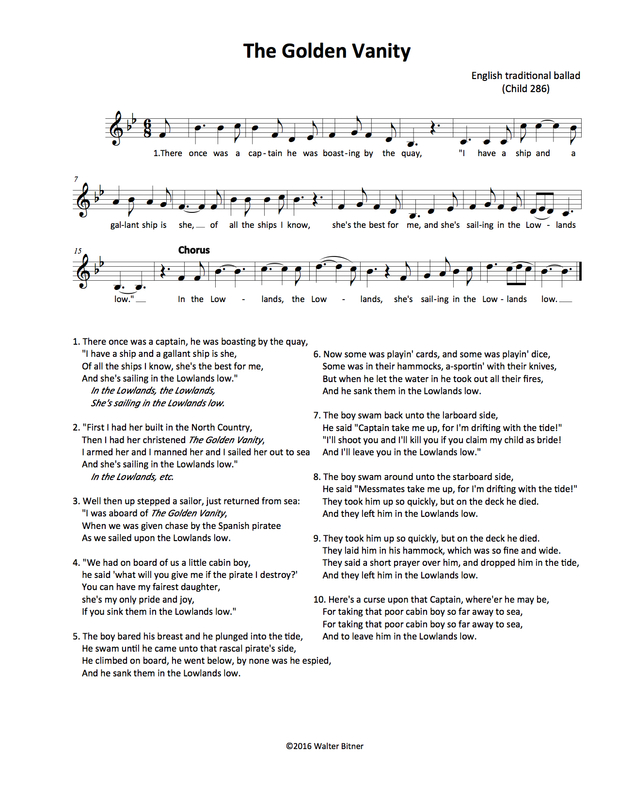 My students were captivated by the story of the brave cabin boy who single-handedly sinks the pirate ship yet is betrayed in the end by his own captain, and I have many memories of singing the version below with my elementary school students over the years. I remember in particular that many times students would remark that it was “such a sad song” or that they wished that the story hadn’t ended that way, yet the fact that it did never deterred them from wanting to sing it. I believe that it is in fact healthy and important for children to be given the opportunity to contemplate death (and other issues illustrated by this story, such as bravery and injustice) from the comfortable safe environment of the classroom as something outside of themselves, before they are faced with death personally. A music teacher who provides these opportunities for her students is not only teaching skills and content, but sowing seeds in the psyche of her students for the development of a mature human being. For teenagers – many of whom have already faced some kind of personal loss directly (I had many students over the years who had personally faced the death of a parent, grandparent, sibling, or other relative) – the opportunity to contemplate death through the music we rehearsed and performed in choir was not only a cathartic experience, but also a way for some to confront their grief and loss and share it with their peers, without directly expressing their feelings in their own words, which is often awkward and difficult for students at this age (as it remains for many adults I have met). Teens yearn for powerful experiences, and for the opportunity to stretch themselves and feel powerful – to cultivate a personal feeling of “I can” based on the experience of accomplishment. Many teens also have a strong desire to belong to a group they feel they are important to, a group whose exploits they can feel proud to have contributed to. For these reasons, I chose to learn and perform complete and major works with my high school choirs when we could. Pursuing the performance of a large scale choral work (with orchestra when possible) gave them a mountain to climb: a long term project over the course of a semester or school year that would provide a wide field for developing their musical skills and abilities as individuals and as an ensemble, texts that address ideas and emotions that could deepen them as human beings, and provide experiences they would remember for the rest of their lives. It is no secret that many of the greatest works in the choral repertoire are composed to texts that contemplate death. The Requiem Mass seems to lead the way: many of the most popular pieces in the repertoire are works by Mozart, Brahms, Verdi, Fauré, Duruflé, Britten, and others that are either written to the traditional texts, are inspired by them, or simply provide consolation and contemplation for those confronted by death, which is of course, ultimately, everyone. My experience teaching movements from major works like the above – such as Wie lieblich sind die Wohnungen from the Brahms Requiem or Lacrimosa from the Mozart Requiem – or entire works like the Fauré Requiem or Sebastian’s cantata BWV 106 “Actus Tragicus”, provided fertile opportunities for deep musical, emotional, and community experiences for my students (and myself). This article appeared in the March 2019 issue of Choral Director magazine. If writing about Mahler 9 got me started mining this vein, other articles that came along kept the thread going: Brahms Requiem at West End UMC last April, reflections on the passing of an adolescent idol Chris Squire in June, and writing about the mystery of how Sebastian was grieving for Maria Barbara as he finished compiling the exuberant Brandenburg Concertos in October. By the end of the year I had realized how vital I feel this subject is as the symphony’s performances of the Mozart Requiem at the beginning of January approached, yet as much as I wished to write about the Requiem, I felt unable to start without beginning to lay some groundwork. I have a long history with Mozart’s Requiem, which I hinted at in Solfège With Amadeus in September, but I just wasn’t ready to write more about it yet, so instead I went back – maybe not to the very beginning, but pretty far back – and posted a retelling of the myth of Orpheus as my first article of 2016. Writing about Pictures at an Exhibition – a musical memorial – last month and then about another requiem performance – Elgar, Poulenc, & Lauridsen at West End United Methodist – a couple of weeks ago really brought home to me the need I feel to address this, and to find a way also to begin to relate it to my experience and some of the choices I made as a teacher. 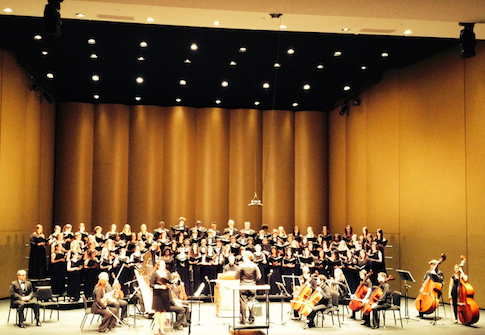 By walterbitner in Choral, Education, Music, Music Education, Philosophy on March 24, 2016 . Thank you WB, for this thoughtful piece. Found myself saying “yes, yes” in so many places. Death is so often hidden away in our modern society — to the detriment of children and adults alike. 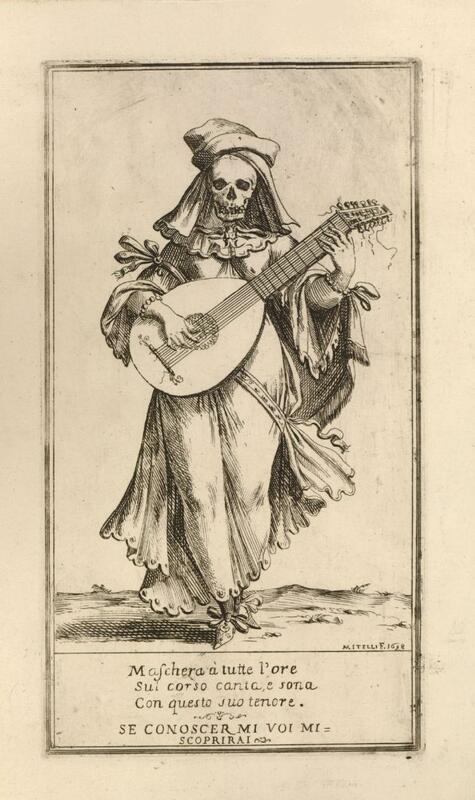 And music plays (or can play) so many roles in learning about and grappling with death. As a lifelong Lutheran, you had me at “a Mighty Fortress”, of course. And I’ll note, parenthetically, regarding [whether we approach death] “with faith or as a mystery”, for some of us it is, indeed, both. Another fine article…I enjoyed your “The Golden Vanity” song…I still have some more to read in detail…Thanks for the articel..nice job. I really enjoyed this posting and all the music clips Thanks!